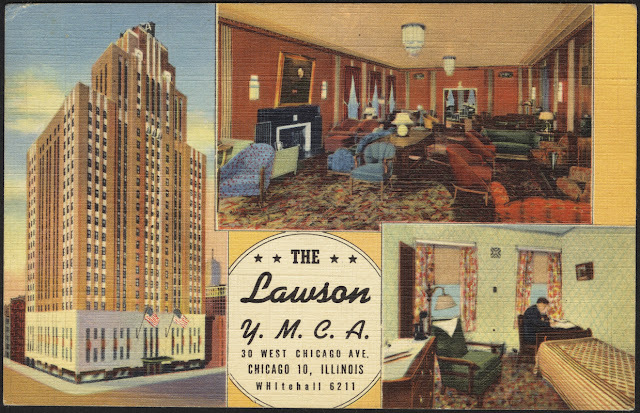 October 30, 1931 – The largest Y. M. C. A. in the world is officially opened at dedication ceremonies on this date in 1931. The new Lawson Y. M. C. A. on the northeast corner of Chicago Avenue and Dearborn Streets rises 24 stories and is built at a cost of $2,754,000. The new building is named after Victor F. Lawson, the late publisher of the Chicago Daily News, who left $1,500,000 to start the project. There will be 650 residential rooms with 700 telephones, and each room in the building will have a radio speaker that allow a choice of five programs. As described by the Chicago Daily Tribune, facilities include “a small chapel for private meditation and group worship; a completely equipped ‘log cabin,’ with an artificial woodland view out the window; a room of 1950, done in an ultra-modernistic style; the Lawson Memorial library; a boxing room with permanent ring; two large gymnasiums; volleyball and handball rooms; locker rooms with accommodations for 2,500 men; a rifle range; 10 studios for hobbies, handicraft, and music; mechanical exercise room; a swimming pool, 62 x 25 feet, with a 12 foot depth in the middle for diving; restaurants, grills and cafeterias, and fountain rooms. There is also a roof garden on the 19th floor” [Chicago Daily Tribune, October 25, 1931] In May of 2017 developer Peter Holsten, who paid one dollar for the building with the caveat that it provide affordable housing for at least 50 years, announced a $100 million plan to convert 583 units into 400 larger units with private bathrooms and kitchens. The plan also will replace exterior fire escapes with two enclosed stair towers and install a new bank of modern elevators. October 30, 1907 – Wouldn’t it have been interesting to be serving the coffee on this day as Mayor Fred Busse, First Ward aldermen Michael Kenna and John Coughlin and a committee from the Commercial Club meet in architect Daniel Burnham’s office atop the Railway Exchange Building on Michigan Avenue. Two days earlier the city council had passed an ordinance directing the commissioner of public works to gather plans for connecting Beaubein Court on the south side of the river with Pine Street on the north. The meeting in Burnham’s office is one more step in a process of trying to unite the north and south side boulevard systems that has been dragging on for over 15 years. After the meeting Clyde M. Carr, chairman of the Commercial Club committee, says, “We have acted and will continue to act as a clearing house for ideas on this subject. We have not given our support to any one plan, but are anxious to push the first worthy plan that the authorities may decide upon as feasible. What we are striving to keep in mind is the future – something that will give glory to Chicago for a hundred years to come. We do not want a makeshift or a compromise.” [Chicago Daily Tribune, October 31, 1907] It will be another 13 years before the lawsuits are settled, the property acquired, and the great bridge leading Michigan Avenue across the river completed. 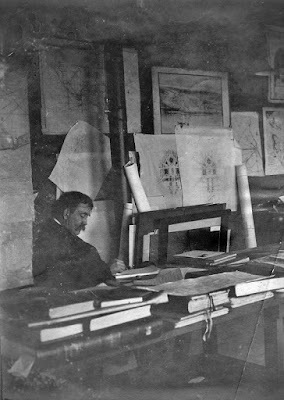 Daniel Burnham is pictured above in his office atop the Railway Exchange Building.